Multichannel inventory management system, such as EasyERP, that can combine several shops in one place is a very powerful tool to improve your business. It can take you a lot of time and effort to master all of its elements and options. This guide will help you with this task. We will try to cover every aspect of the integration of Shopify with EasyERP, so you will have indepth knowledge about the process. You will know what happens in the vast variety of situations, that means no bad surprises for your business. You cannot predict all situations that can occur with your shop or inventory. Everybody makes mistakes, if you have coworkers or employees you can multiply the chances. Customers can give you a puzzle to solve too. To help you with this task, we try to cover every possible situation in this guide. Stock levels - once again your are in full control, change the level in EasyERP and all connected shops will follow. Create new product Shopify Creates the product on Shopify store. Does not create a new product on EasyERP. All data will be synchronized during the nearest synchronization. EasyERP Creates a new product on EasyERP. Does not create a new product on Shopify. All data will be synchronized during the nearest synchronization. Delete a product Shopify Deletes a product on Shopify. Does not delete a product on EasyERP and the linking between products on Shopify and EasyERP. For correct product deleting on Shopify and EasyERP first you need unpublish the product from channel and only then delete it from EasyERP. EasyERP Deletes a product on EasyERP and the linking between Shopify and EasyERP. Does not delete the product on Shopify. For correct product deleting on Shopify and EasyERP first you need unpublish the product from channel and only then delete it from EasyERP. Hide a product Shopify Hides the product, so it is not visible in listings. Nothing changes in EasyERP side. To read the details, go to the Hide a product chapter. Unpublish a product Shopify No such function. EasyERP Deletes a product from Shopify. Doesn’t affect on an instance of product in EasyERP. Update a product Shopify All updates do not change the product in the EasyERP. EasyERP You can change any field of information, and it will be uploaded to Shopify during the nearest synchronization. 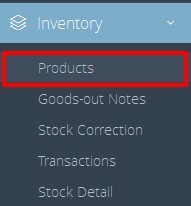 Update stock levels Shopify Does not update the stock level in EasyERP. To have stock levels up-to-date you need enter information on EasyERP side and then publish it to Shopify. EasyERP Updates stock levels on EasyERP only. Levels on Shopify store will be updated only during the nearest synchronization. In order to do so, when creating a product you should turn on Inventory policy option, so Shopify would track stock levels. Update prices Shopify Updates the price only on Shopify store. Price will be overwritten on Shopify store by price from EasyERP during the nearest synchronization. EasyERP Updates the price only on EasyERP side. Price will be updated on Shopify only during the nearest synchronization. If you own a shop on Shopify, then you have to create or edit products and listings. You can do this in two possible ways: create it in the Shopify shop, or using EasyERP multichannel inventory management system. In case that you only own one shop, and do not plan to expand your business you can only use Shopify, but in case when you expect your business to grow and be successful it is highly recommended to use EasyERP. Chances are, that you already know how to create a product on Shopify, so we won’t cover that here, instead we will give you full information how to create your product on EasyERP and publish it to Shopify. To begin this process you need to have already established and functional shop on Shopify and it needs to be integrated with EasyERP. Then log in into EasyERP inventory management system and go to Inventory/Products. This opens a create product menu. Fulfill all necessary fields. If you have questions or doubts how to create a product in EasyERP multichannel inventory management system, please read the more detailed documentation here. After all information is inputted, press the Create button at the right bottom corner of the form. Now is time to publish your newly created product on Shopify. To achieve this click Configure publishing button at the top of the screen in the Inventory/Products menu. This action opens View unpublished listings menu, here you must select an integration channel and a price list. The choice of integration channel influences the choice of shop, where this product will be published. And the price list you have chosen, will determine the price of the current product. Keep in mind that you can create several price lists for every shop that you have integrated. It is a great feature of the EasyERP multichannel inventory management system. Then you need to choose a channel, price list and click Continue button. Now you see a list of your products that are available for export to the determined shop, in this case on the Shopify market platform. Also in EasyERP multichannel inventory management system you can export your listings to Magento and Etsy shops. To publish your products from this menu you have to mark them by tapping on the corresponding box to the left of the product. After selecting at least one product the Publish button will be visible at the top of screen. Cool feature is that you can select and eventually publish several products at once. To do so simply check their boxes, by tapping on them, you can even select all page of the products by checking in the box in the column identifier. In short moment your product from EasyERP will be published to Shopify store. As you can see this process is fast, simple and mistake-proof. Now you can publish some more products, or publish the same product or products to another channel. All products on EasyERP side are stored as variants. When you open products page you will see the list of variants that are grouped with SKU. So when you open product that has many variants then in fact you see the variant details and other variants listed on the bottom. You can see all variants of one product. But you will see directly variant, it is marked by color in the list as first item in the table. Below you can see the variant detail page and another variants with the same SKU as one product with its variants. As was mentioned above in Shopify introduction and overview the variant that you are watching now is marked by colour. This item is the first one in the table and it is highlighted by red color. If the variant is published to any channel then you can see it from one place. Grouped variants allow you manage them easily: delete, edit or update. Clicking on edit icon will open for you edit page for selected variant which will be highlighted by red color on the variant list. Everything related to product can be edited: product name, type, category, prices, etc. You can monitor stock status of variants. As well you can add new variants into EasyERP from Edit variants tab where you can find all options and their variants linked to selected product type. Note: Shopify supports only three product options, you can not add the fourth one to variant. This is Shopify platform limitation. More about Shopify limitations you can read in the end of this article. Hiding your products may be a viable and usable option on Shopify, but it is not present in EasyERP multichannel inventory management system. Products cannot be hidden or not active in EasyERP. We made this choice because we need a flexible system that can work not only with Shopify but with Magento and Etsy too in order to do so some sacrifices had to be done. You can substitute this function by just unpublishing products in EasyERP multichannel inventory management system. In this case, they will be completely deleted from Shopify. They won’t be hidden, or restorable in anyway from Shopify administration panel. But they will be still available in your main inventory and stock management system, EasyERP. And you will see what product are published on what platform, from the information displayed in the Sales channel column of the Products menu. EasyERP multichannel inventory management system allows you to delete a product on every market platform you have a shop on. If you delete your integrated product from EasyERP inventory, without unpublishing it, then this product will simply be added to your inventory on EasyERP again after synchronization. Which occurs every 15 minutes. To completely delete your item from integrated shop and from EasyERP first you need to unpublish the product from all channels where it is published. For this, press the Unpublish from channel button at the top of the Inventory/Products menu. Then you need to select a channel, from which you plan to delete a product. Select a integration channel from the drop down list and press Continue. This action will display all of the products which are published on the selected channel. Now to unpublish them, select them by tapping on the corresponding box. They are located to the left of the product name. If you decided to unpublish the whole page of products you can select them by checking the box in the column identifier. Now when you have selected the products press the Unpublish button at the top of the list. Afterwards delete it from EasyERP multichannel inventory management system. This is one of the most easiest tasks. It only has two steps: select a product you want to delete by tapping on the corresponding box, then press the Delete button at the top. As you can see, when any product is selected the New button turns into Delete button. Now, just confirm the operation in the browser confirmation dialogue window and your product is deleted. This way the item will be completely removed from all of your inventories. Storing all of your products in the CSV file for backup or data export is a very common and useful practice. And we are happy to say that this practice combined with the EasyERP multichannel inventory management system will not bring you any problems. Even if your system is already integrated with several shops on a various platforms. It is a very easy process to add products to any platform you like, including Shopify, from a CSV file. To do this you will need to import data from your CSV file to the corresponding market platform. For example, if you have generated this product from Shopify, you should export it there too. This limitation is caused by the fact that every system generates unique CSV file. They often have exclusive types of data, fields, etc. For example CSV generated in Shopify will not be imported correctly into Magento. Then you will have to delete integration channel in EasyERP, to do so go to Settings/Integrations. Note: Before this action save the name of the channel, later on you will have to create it again with the same name, to avoid duplicates and unlinked products and orders. This action will not delete all your imported items from EasyERP, this will only stop the synchronization. After that create the channel again, this will import your products that were imported from CSV file, and add them to the already existing ones. Be sure that you create a channel with the exact same name that you have deleted before. That’s it, with few easy steps you have imported products to your multichannel inventory management system from a CSV file. Duplicate of a product is another instance of the product that is visible in your listings. That means that one physical product is displayed more than once in your shop. We believe that, this is a negative thing in a multichannel inventory management system because it can confuse you and your customer, which will lead to a bad experience. So to avoid this problem you will have to know what produces this duplicates. First of all (you can do this manually, in your Shopify administrator panel) you will have to go to the Edit Product menu, and press the Duplicate button there, but this action will not create a duplicate in EasyERP, only on Shopify. Another possible way of creating the duplicate is a little bit trickier, but again manually. You can create two identical products in EasyERP and then publish both of them to Shopify. But creating a duplicate this way can be sometimes useful, because it is fully under your control, and cannot be done by mistake. Another way of creating a duplicate in EasyERP multichannel inventory management system is to manipulate with integration channels. Be careful when you delete these channels. If you will create a channel to the same shop again but with a different name it will duplicate all of your products. To avoid this, remember or write down the exact channel name, and if you decide to delete it and create again, for some reason, always use the same name. EasyERP has a useful tool to deal with duplicates. It is the Resolve conflicts button in Settings/Integration menu. Conflicts in EasyERP are the products that were imported through some channel and have the same name and SKU as the one that is already existent in EasyERP. In other words, conflicts are duplicates. Another possible source of unwanted duplicates are the third-party apps. We cannot predict every way in which some apps work or will work in future with your store. So to avoid any damage to your valuable information we do not recommend using of any third-party apps altogether. This way, we can assure you that integration of your store with EasyERP will bring you nothing, accept profits.